Despite being a resident of North Carolina for over a quarter century of my life, until a few weeks ago I’d never been to Asheville. A city that’s well known across the country for its charismatic charm, breweries, grand estate, waterfalls, and the scenic Appalachian Mountains. When you add it all together it makes for the perfect romantic weekend in the Smoky Mountains. Once we finally made our way to Asheville we found a city ideal for couples. If you’re looking for a romantic getaway in North Carolina then look no further than the mountains. Escape with your loved one to this small Appalachian city packed with plenty to do, eat, and see. 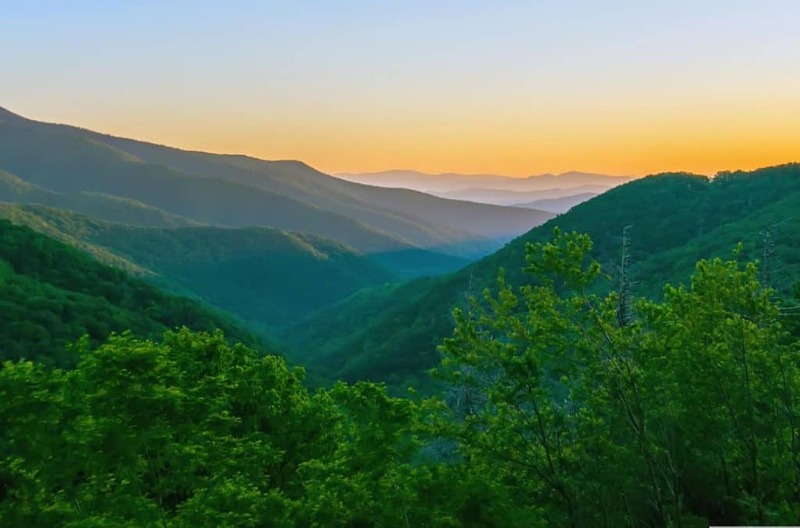 The smoky mountains are some of the oldest mountains on earth and at one point reached as high as the rocky mountains. Now, after centuries of erosion, we have their present landscape or rolling hills and thousands of rivers and streams. 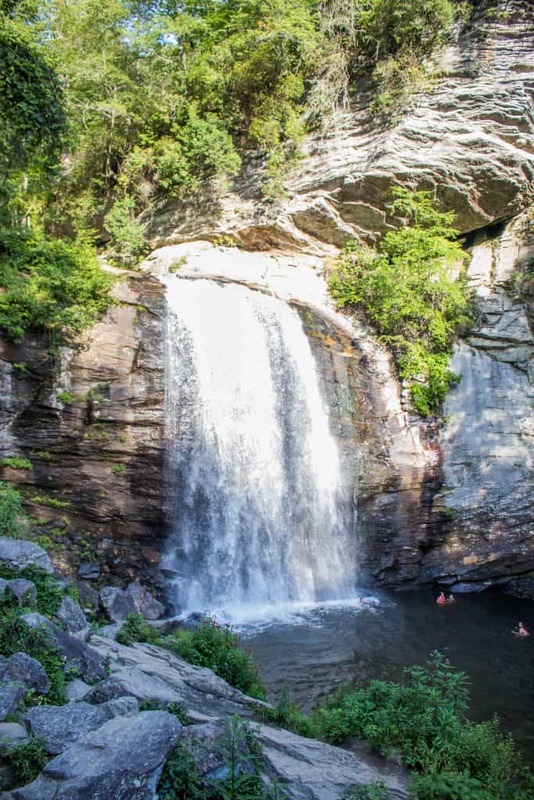 Within a short distance of Asheville are dozens of waterfalls that are all a short drive from the city center. Just make sure to bring a bathing suit as the waterfalls are perfect to take a cool swim in the summer. 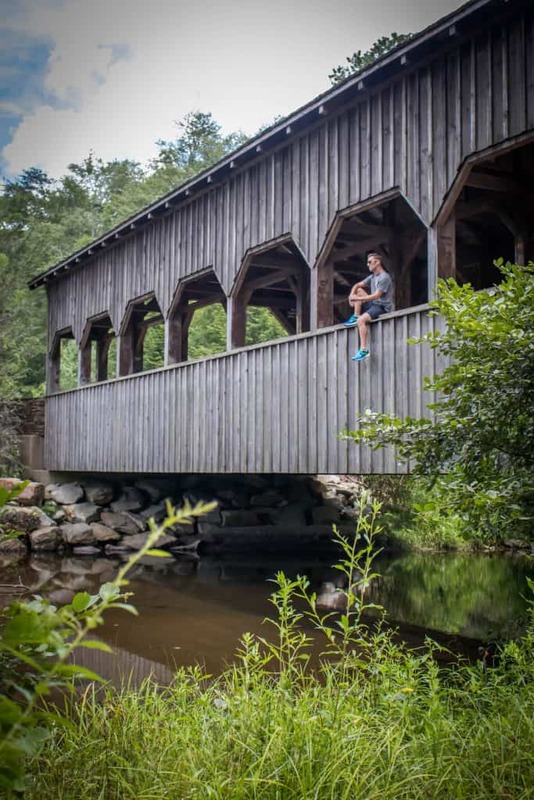 One of the best spots to head close to Asheville is The Dupont State Forest. Trails are well marked and it’s possible to do a short three waterfall hike in under two hours. However, we brought a picnic lunch and made a day out of lounging by the waterfalls. If you’re truly looking for a spectacular romantic getaway experience around Asheville then a hot air balloon ride over the mountains will do the trick. We’ve taken hot air balloon flight a handful of times and cannot recommend them enough. However, they often come with a high price tag so it may not be the best value activity. Head to one of the two amazing National Forests in the area and bring a packed bag. The Blue Ridge Mountains have long brought vacationers looking to escape the heat in search of beautiful vistas. 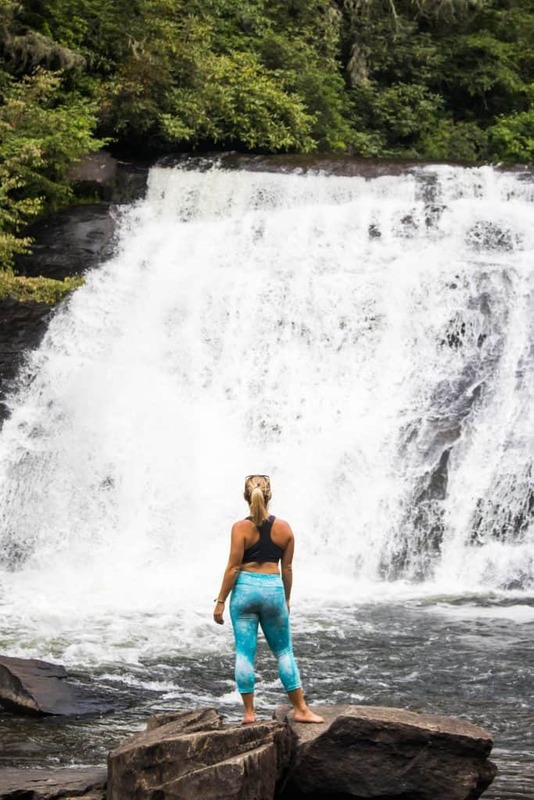 Pisgah National Forest is a short drive outside of Asheville and it’s an amazing place to explore for the day. Find rolling mountain fields and dense Appalachian Blue Ridge Forests along winding trails. When packing a picnic we always go light. Classic staples for a successful picnic include a light wine like Sauvignon Blanc, Rose, or Pinot Grigio. Then we like to pair it with two great kinds of cheese like aged clothbound cheddars, chevre, aged gouda, brie, or aged sheep’s cheese. When it comes to fruit go seasonal and pick up some local items like berries in the spring/summer and apples/pears in the fall/winter. Pick up some bread or crackers and add a pre-made tapas like dolmades for the perfect romantic picnic in the sun. 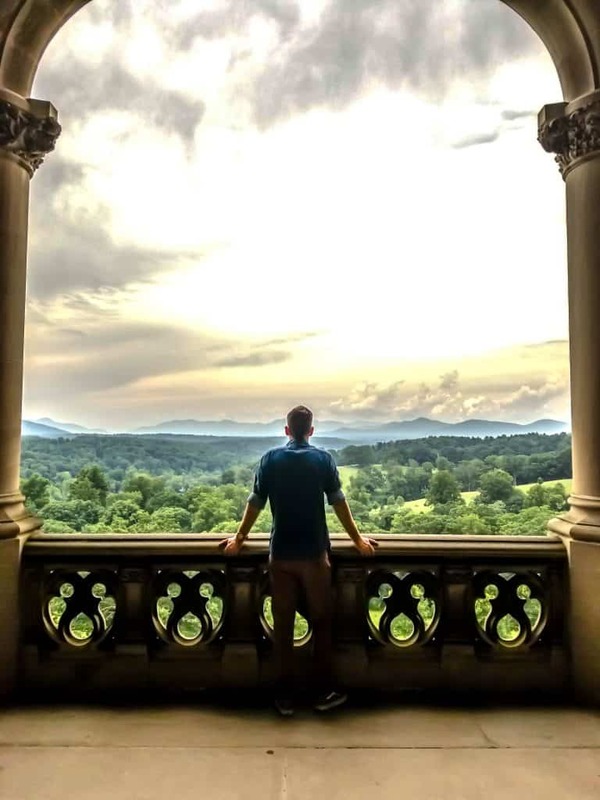 You’re likely to see the Biltmore Estate mentioned in anything you read about Asheville and it’s for good reason. The famous estate is the largest private residence in the United States and built by George Vanderbilt, heir to railroad fortune. His massive home sits on a grand estate adjacent to the city and has been entertaining guests since it first opened its doors in 1895. We spent a whole day on the estate and would suggest at least several hours to fully enjoy the Biltmore too! Start the day with a tour of the 178,926 square foot house with 250 rooms. After you finish up the tour go explore the gardens and the rest of the estate designed by famed landscape architect Frederik Olmstead. For those of you who don’t know, that’s the guy who designed Central Park in Manhattan. 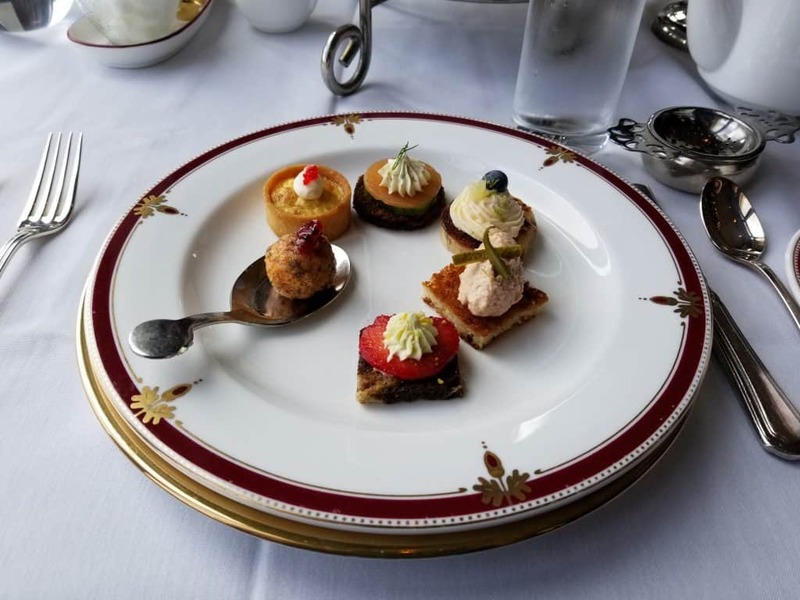 Afternoon tea at the Biltmore Inn is another amazing experience to have. We’ve done Afternoon tea at other hotels and have been disappointed, but the Inn managed to thoroughly impress us. If you’re looking for a special experience filled with loose leaf tea, fresh pastries, and macaroons this is something we highly recommend. Also make sure you leave time in your day to check out the Biltmore Winery with your free tasting ticket. Take to the road and spend a few hours exploring one of America’s most scenic drives. 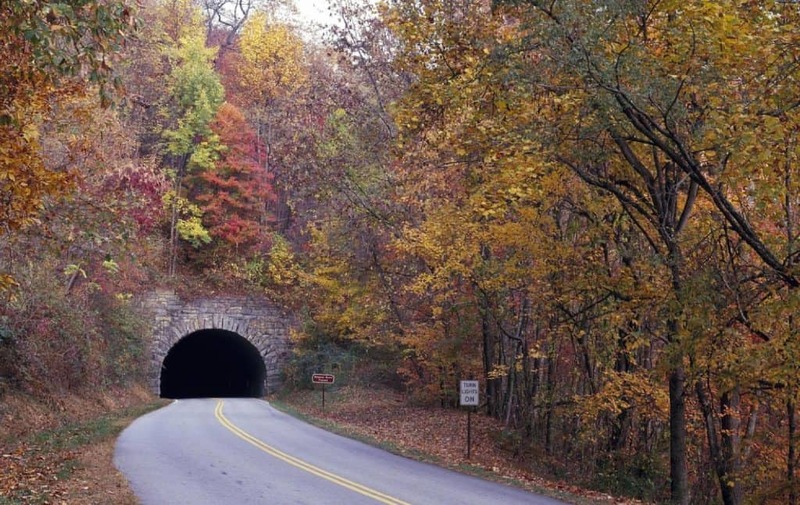 The 469-mile scenic road passes right through Asheville and makes for a fantastic place to road trip. I’d recommend starting in the afternoon after a morning hike to catch it in the evening light. Or you can make a full day out of it touching on hundreds of trails and various view points that are located along the beautiful road. If you’re visiting in during the fall season, be prepared for a crowded road as ten’s of thousands “leafers” are in search of the stunning fall colors. What’s more romantic than tasting decadent chocolate? The French Broad Chocolate Lounge offers an amazing selection of sweet temptations. We just followed the line out front to find a tasty liquid truffle. They also offer tours of their factory and you can see how they handcraft their wonderful chocolate. Head to the top of Asheville’s most famous hotel for some sunset drinks. The iconic Inn has sat atop Sunset Mountain for over a century, and offers an amazing view of the western mountains. The old hotel was built using giant boulders from the surrounding mountainside. All sorts of famous guests have stayed at the grand lodge including ten U.S. Presidents. We recommend that you catch the sunset while dining al fresco or unwind in their subterranean spa experience. There’s no better way to spend a romantic weekend in North Carolina than this. Although it may not be Nashville, Asheville is still considered one of the “Greatest Music Cities” in the United States. 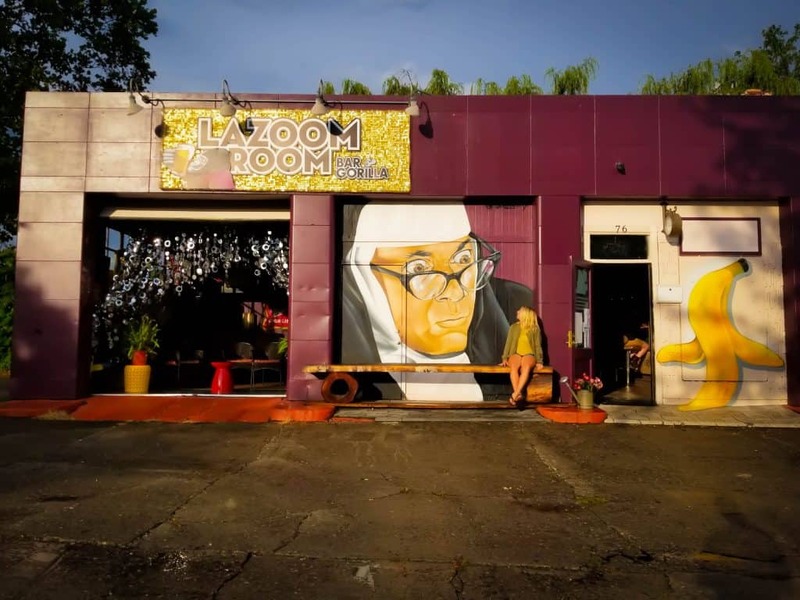 There are a number of music halls like The Orange Peel, neighborhood bars, and even the streets of downtown play host to some of the best in local and national touring musicians. Are you a romantic couple that also likes drinking beer together? Asheville is the mecca place for craft beer enthusiasts on the East Coast. The secret ingredient is the mountain-filtered water, making for some of the most sought-after ales, stouts, and sour beers in the southeast. With more breweries per capita than many other cities in the United States, you’ll have plenty of beer options to consider. Despite only having a population of around 80,000 Asheville packs a number of great places to share an intimate meal together. Check out below for our romantic dinner suggestions. 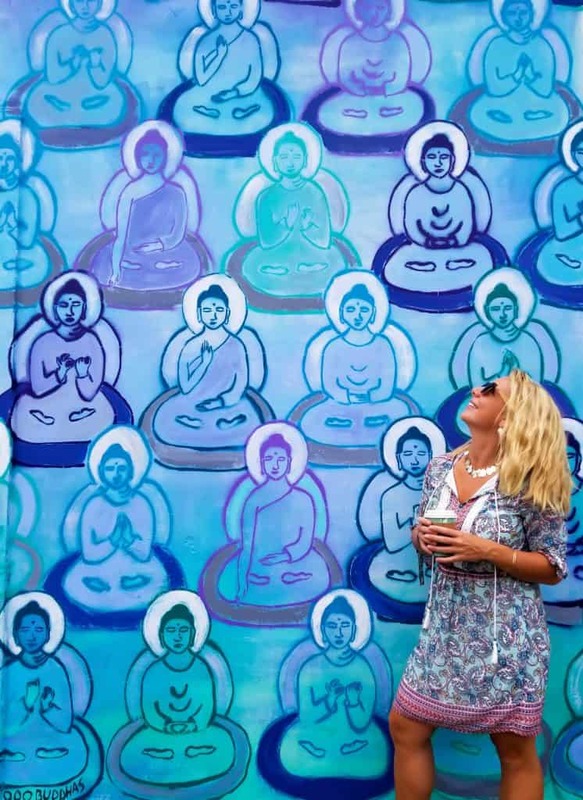 Take advantage of any number of the Asheville’s numerous spas. One of our favorite activities as a couple is to relax the day away together at the spa. Asheville’s day spas and resorts are great at catering to couples, with many offering couples massages and treatments for both sexes. Located in a former office building that was built in 1907 this hotel will be sure to set the mood of a romantic trip. The old building has been converted into a boutique hotel with large suites for each guest. Despite having a modern facelift all of the charm of a century old building seems to have remained with beautiful floors and windows. 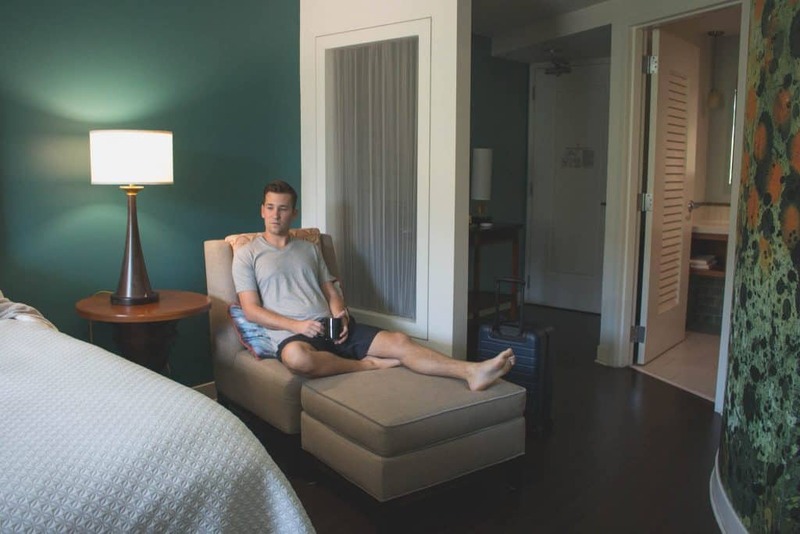 Each room at the Windsor is more of an apartment with a full kitchen, private bedroom, washer and dryer, and living room. We loved the attention to detail throughout the hotel and found the overall artistic design gorgeous. The best part about the Windsor, however, was the location. 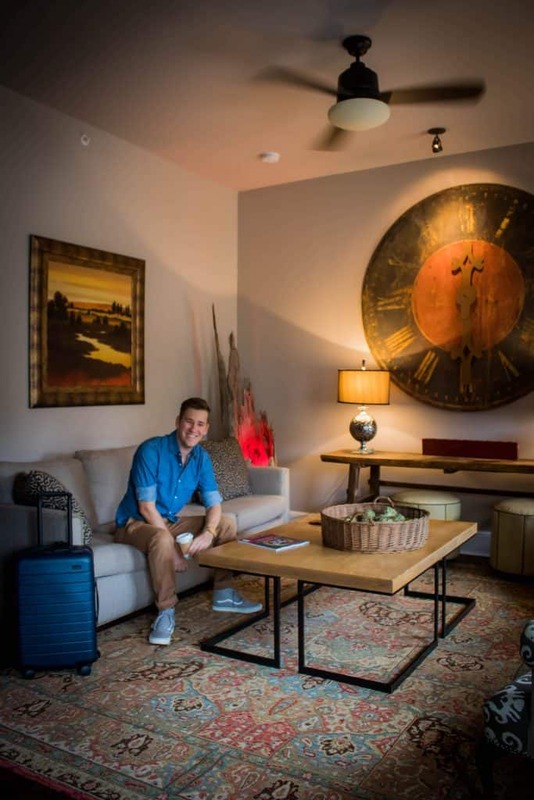 Situated right on Broadway street The Windsor is within walking distance to all the best shops, breweries, and restaurants in Downtown Asheville. 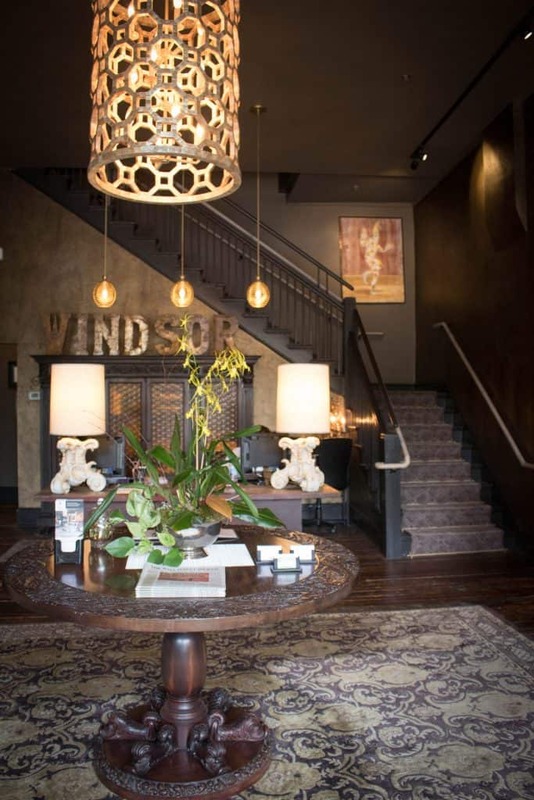 Regardless of the duration of your stay, the Windsor will make you feel at home. 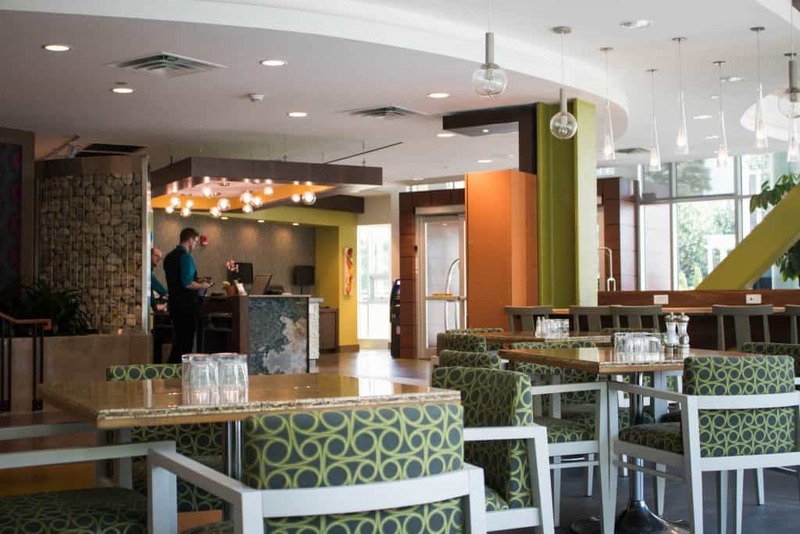 If you’re looking for a no fuss option for your stay in Asheville then check out Hotel Indigo. Hotel Indigo is a modern hotel with some trendy design elements. The hotel is located downtown and is within walking distance to all of the restaurants, art galleries, and shops. Hotel Indigo features cozy and airy main lobby and inviting guest rooms with massive beds, unique murals, and large bathrooms. There’s even a fitness studio with cardio equipment and free weights to keep in shape in case you don’t have time to hike. The hotel is a great option as it has all the creature comforts one could want at an affordable price. At less than $200 a night, it comes in at about half the cost as The Windsor and a sixth of the Biltmore Inn. There’s on site valet parking here, a business center, bar, and even a restaurant. One of the best things about Hotel Indigo is that it is pet-friendly – perfect for those traveling with their furry loved ones. We were super comfy our entire time at the Hotel Indigo and thought the staff and rooms were fantastic. Can’t wait to return one day. 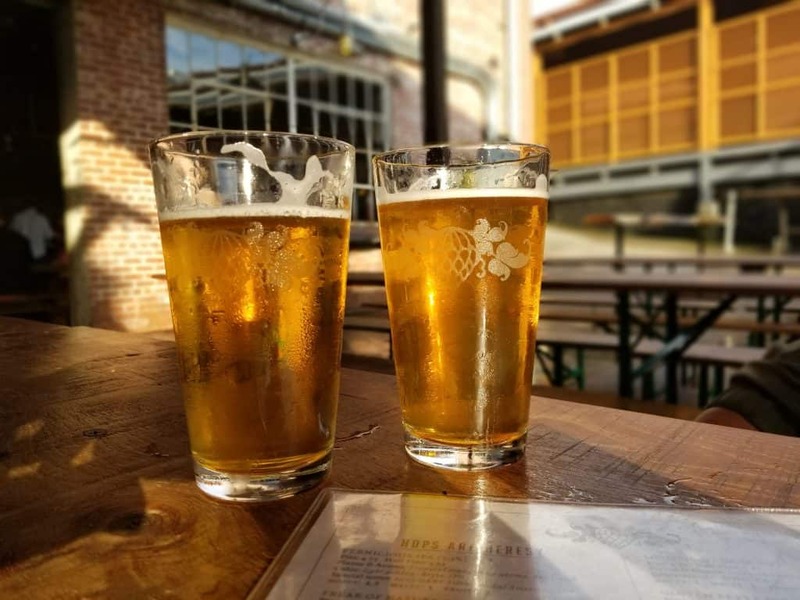 Wicked Weed Brewery – A much loved local brewery with the perfect taproom in the back to relax with a cold brew. White Duck Taco – Taco shop serving up some delicious and innovative double corn tortilla tacos. Highland Gaelic Brewery – The first craft beer in Asheville and one of the first in the state. There Gaelic Ale has long been one of my favorite beers made in NC. Curate – This is the “it” place in Asheville right now serving up Spanish tapas. Dinner reservations are advised. We showed up without one on a Tuesday night and were turned away. Trade & Lore – The best coffee shop in Asheville. Green Man Brewery – Great brewery with some fantastic options. Rhubarb – Amazing farm to table cuisine with a James Beard Award winning chef at the helm. Top of The Monk – Cocktail bar that serves up fresh cocktails above the Thirsty Monk a great brewery in downtown Asheville. Green Sage Cafe – Great cafe for fresh lunches and breakfast. 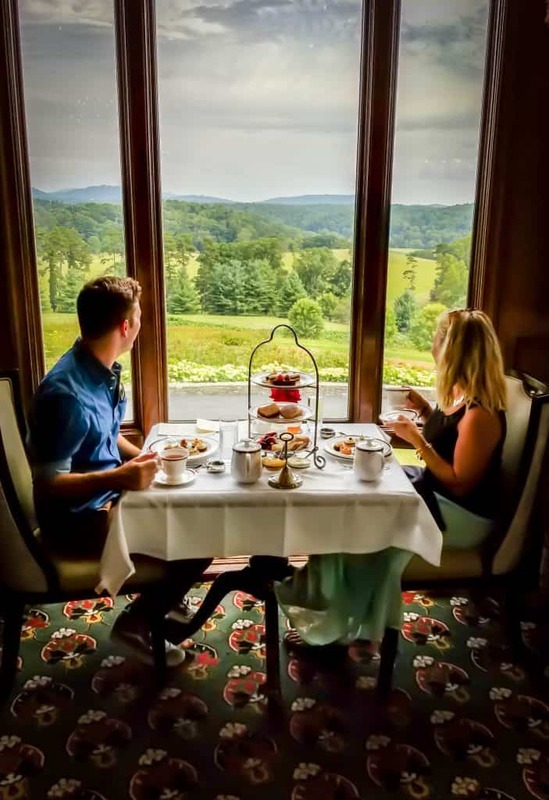 Biltmore Inn – Their fine dining restaurant is perfect for a memorable romantic dinner. And their lounge serves up an amazing afternoon tea with a piano player. Biscuit Head – The name says it all. Come prepared for some awesome southern biscuits and clogged arteries. Many breweries are within walking distance from each other around the downtown area. However, when heading to the more remote breweries don’t worry about driving as the Brews Cruise will safely deliver you. Every Friday night between 6pm – 10pm there is a drum circle in Pritchard Park. Anyone is invited and it’s a fun atmosphere for all. There are two seasons to know in Asheville. That is when the wildflowers bloom between April and June and the fall foliage season begins around September/October. The Biltmore Estate is one of the most popular tourist attractions on the East Coast, and certainly the most popular for Asheville. That can mean big crowds in the summer and Christmas season. If you want photos of the famous estate without people in them then head there early in the morning. If you want to try your hand at the Appalachian Trail it’s not far from Asheville. Head to the Max Patch Mountain trail for a short hike and amazing views.